A couple of weeks ago I visited the William Sandberg exhibition at the De La Warre Pavilion in Bexhill. Sandberg was the typographer/designer and director of the Steidlijkt Museum in Amsterdam and it was interesting to see the prolific output of exhibition posters he designed for the museum; particularly those printed by letterpress in Amsterdam by the Stadsdrukkerij. Letterpress by its mechanical nature can be very constraining but Sandberg very neatly managed to circumvent this with imaginative creative use of type and minimal text. Sadly I haven't any images as the exhibition attendant was very strict on the no photography policy. Well worth a visit. 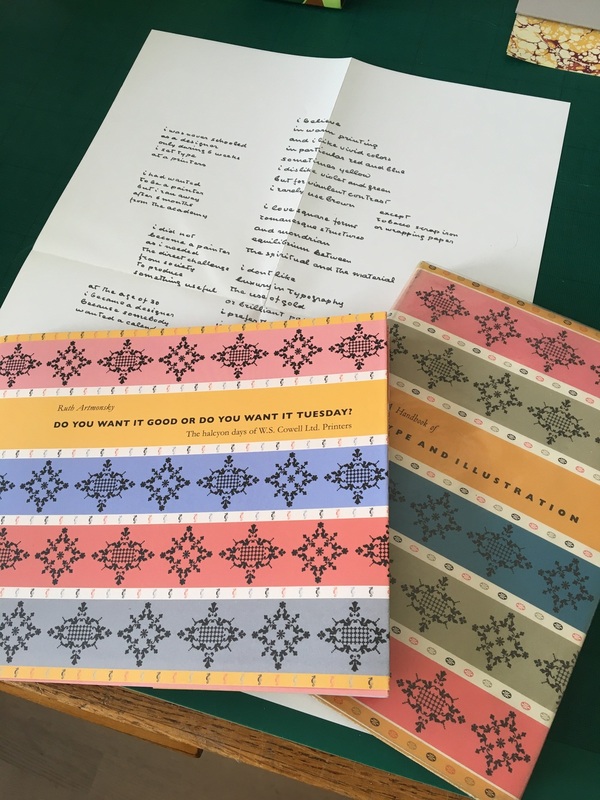 Whilst I was there I noticed a very nice selection of books published by Ruth Artmonsky on mid-twentieth century commercial art and publishing including this one on the books of W.S Cowell Ltd - if you like Little Tim, Orlando, Puffin Picture Books, Ravilious etc I recommend it. Shown here with my own copy of Type and Illustration complete with its dust jacket and the Bawden Linocut of crabs which is often missing. 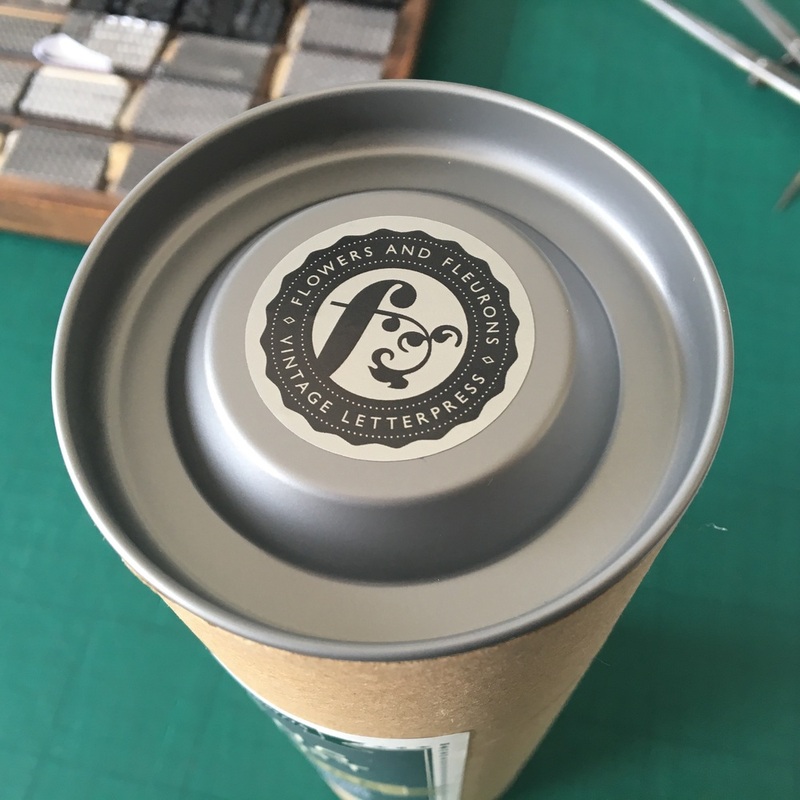 Super branded sticky labels on metallic vinyl now accompany our prints as they are dispatched. History appears not to have recorded whether Giambattista Bodoni really liked to eat pasta, but he certainly wasn't a Mangiamaccheroni. What we do know is that Mr. Bodoni composed and set type in the same way he ate spaghetti; which was, in the fashion of the period, with his hands. 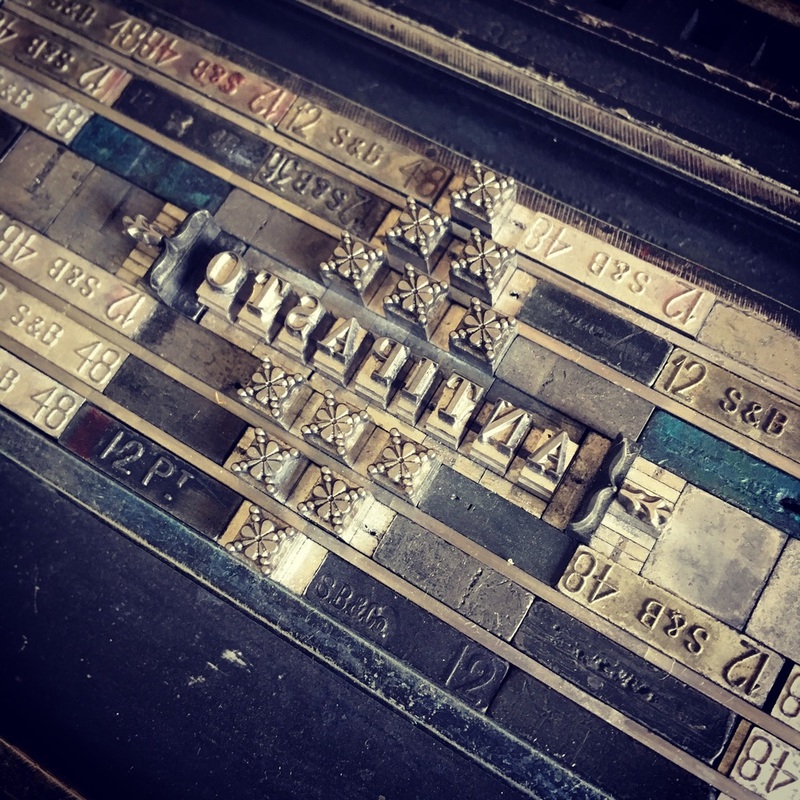 Today We start in earnest printing the Manuale Pastagrafico, a compendium of type, pasta and food terminology hand-set in Bodoni. Buon appetito! Dada is renowned in the typographic world for challenging the normal typographic practices of the period. Similarly this touring exhibition contains prints which feature bold expressive typography; jarring juxtapositions of imagery and modernist graphic forms. 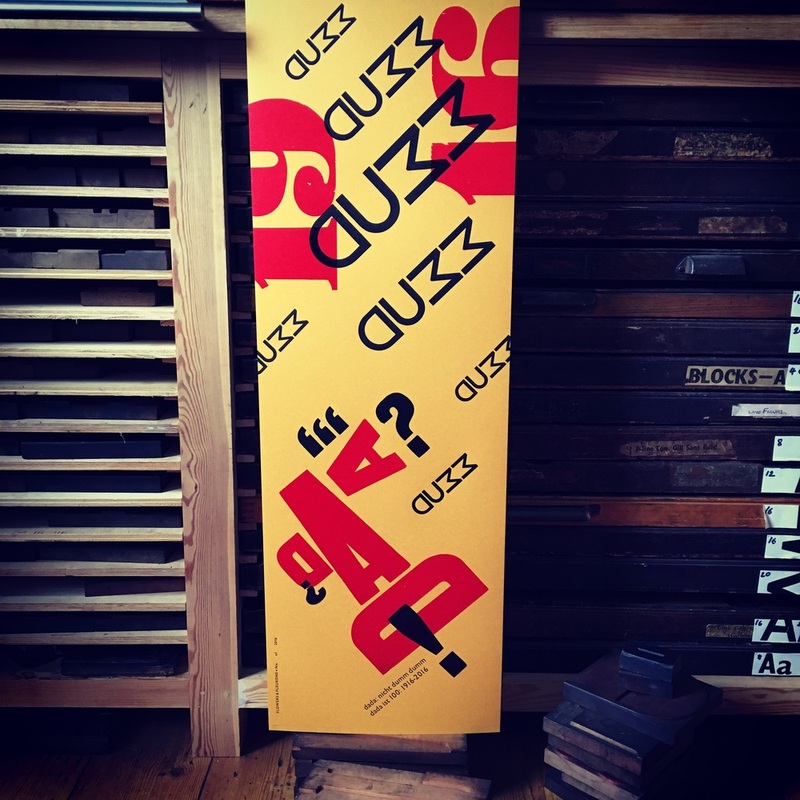 Many presses have utilized experimental techniques within letterpress – a process many consider constraining – to great effect to produce prints which in turn appear nonsensical, ironic, challenging and provocative. For the exhibition I produced two pieces of work: Dada: nicht Dumm (Dada isn't dumb) and Dada Trumpet. The first piece Dada: nicht Dumm uses type as illustration: Dumm is typeset in the form of typographic bombs raining from the sky (and references dum-dum bullets and the mud of the trenches). Dada is expressed as an alarmed typographic face. 1916 bleeds off the page. For Dada Trumpet I considered Dada’s musical tradition and how the intricate forms and tones of brass instruments suggest the surreal nature of Dada. The letters D A D A in the form of large wood type were arranged to form a trumpet shape whilst other letterforms were contrived to form the valves – arranged to produce A or D major when pressed by that most Dada of type ornament, a red manicule or printer’s fist. The music is expressed as exclamatory punctuation expelled from the bell of the instrument. Printed in gold and silver inks with black and red accents. Occasionally the press falls quiet and we go out on a jolly – this weekend it was along the coast as far as Dungeness; the weather was moderate to good as forecast and we spent a lovely time pootling about in that ethereal landscape amongst the wrecked boat huts. Last Friday I arranged delivery of a One Fathom Shipping Forecast to a couple in Birmingham who were retiring after 20 years at sea – he was a marine diver. They bought the Finisterre version of The Shipping Forecast print; aptly framed in Farrow and Ball ‘Plummet’. It is very special when people have a connection to a particular print.